Zone defence relates to your players' ability to take space away from the other team when they are attacking and you are defending. The zone defence drills below will get your players used to setting up a zone - working on their shadowing, peripheral vision skills and their ability to intercept, both as a team and individuals to shutdown the other team's attack. 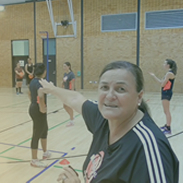 A well organised zone defence will stop an attack, regain possession of the ball and through court linkage (passing to teammates in the different zones) launch a counter attack.